Have you been on Design*Sponge? No? OMG, you are missing out! A favorite from one of my besties, their DIY section contains a wide variety of projects perfect for the all-around crafter. Very cool. I just discovered this gem and can't wait to read their Machine Applique 101 section now that I'm becoming more adventurous with my new multi-stitch machine. Awesome site feature? Make-it Monday...simple, quick and cute projects for beginners and the more experienced. I'm an unapologetic Martha girl, hands down. If you want to learn how to make something yummy and make it right, she won't let you down. Recipes, crafts, whatever. Bookmark this one. Giveaways galore, handmade shopping guides, links to tutorials. This fellow Etsian has an incredible knack for finding and showcasing the ultimate in creative handmade items that you'll soon be drooling over. Looking for indie, green or handcrafted? This should be your first stop. The tagline says it all, "Your daily dose of handmade eye candy". Seriously gorgeous stuff is featured here. Now if I could just pry myself from the computer so I can actually MAKE something. Hee hee. Ummm, wow. 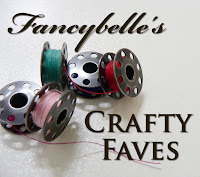 I spent more time checking out awesome craft sites than actually writing about them. So guess what? There has to be a Part III. I just have so much more to share! Maybe not next week, but hopefully sometime very soon. Take care and have a terrific Wednesday. I'm off to grab some coffee, heat up a chocolate croissant my hubby baked last night, and work on my chunky alpaca knit hat...bliss!